I’m shocked that this is my second holiday season and I haven’t shared these English Toffee bites with all of you until today! Thanks to one of my besties, RHONDA (hey girl!! ), she shared this awesome English Toffee recipe with me years ago. 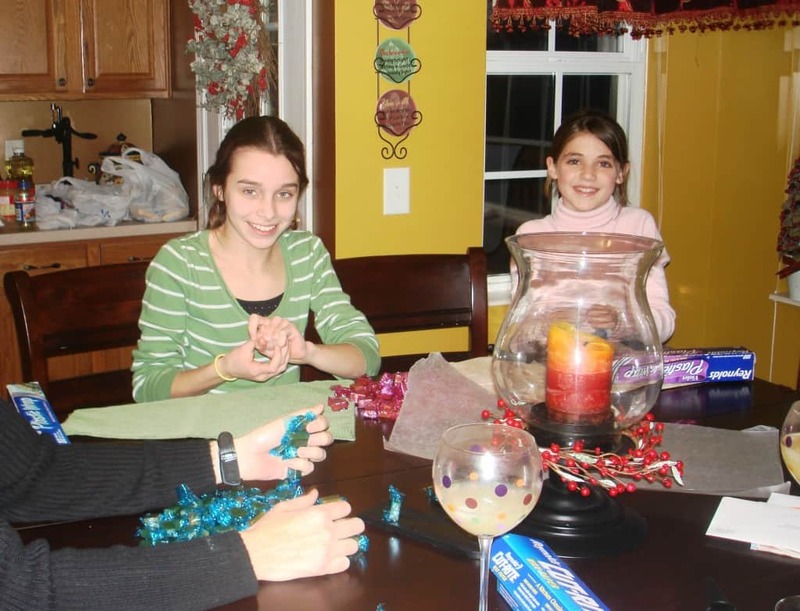 And it became a tradition that we would have a holiday candy-making day. We even would get our oldest daughters involved. Natasha on left, my daughter Alyssa on right- taken in 2008 they were just babies! We usually gave them the job of rolling Peanut Butter Buckeyes and wrapping caramels…you know, the “chores”! This English Toffee is typically made in an 11×7 pan, but a few years ago I found a silicone brownie bite pan. And it’s all I use now. No more slicing toffee, just pop the toffee bites out and you’re good to go. However, if you don’t own one of these pans (or 5 like I do), feel free to pour your English Toffee into a foil-lined 11×7 pan and slice the finished toffee into pieces. Just make sure not to cut English Toffee while it’s cold or the chocolate will separate from the toffee. Keep it room temp! Oh, and breaking English Toffee into pieces will leave you some shards on your cutting board. SAVE THESE. They are delicious on ice cream. Just sayin! My English Toffee recipe starts with whole almonds spread across the pan or divided evenly into each of the silicone brownie bite pan compartments (about 2-3 almonds per slot). In a heavy saucepan, combine butter, margarine, sugar, salt and vanilla. You’re going to want to use a wooden spoon (yes, really a wooden spoon!) to stir this mixture constantly (yes, really constantly!) while it comes to a boil. Once it starts boiling, let it continue to boil for 5-7 minutes. Don’t stop stirring! The goal is for the candy to be the color of almonds. I like to keep an extra almond next to the stove so I can compare the color easily – take a look at the recipe video to see what I mean. If you prefer to use a thermometer, the goal is about 300 degrees. As soon as the candy reaches this point, quickly pour or scoop it into the prepared pan over the almonds. Once the candy has cooled, spread the melted chocolate over the top and sprinkle generously with the walnuts. If you like, you can also choose to cover both sides of the English Toffee or toffee bites with chocolate and walnuts. YUM. WHY DOES MY BUTTER SEPARATE? A couple of things can cause the butter to separate. The first is using cheaper, thinner lined saucepans. Reach for a heavy-bottomed saucepan to help with this. Even using a small enameled Dutch oven would work. The second can be from heating the butter and margarine too quickly. Keep the pan over medium to medium-high heat. Don’t crank the heat up for the sake of bringing it to a boil faster. However, the reason I like to use half butter and half margarine when I make English Toffee is that I find I get more reliable results, without any separation of the butter and sugar. The flavor is still amazing! Give this English Toffee recipe a try. I can promise that these little toffee bites will become a seasonal favorite with your family – they’re too delicious to resist! Why does my chocolate fall off the toffee when I cut it? This is most likely due to excess butter on the toffee surface. Before adding your chocolate, be sure to wipe the top of your toffee with a dry paper towel to absorb any excess butter. If it still feels a little “greasy”, sprinkle a small amount of cocoa powder or crushed nuts to the top before adding your chocolate. This should help! Some people call English Toffee: Christmas Crack. For me, a true Christmas Crack is easy… and is made of saltines. This Christmas Crack is made with saltine toffee and topped with white chocoalte and festive sprinkles. 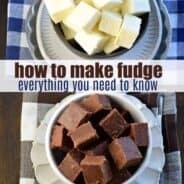 A great alternative if you struggle making toffee! On a foil lined baking dish (11x7)- or in a silicone brownie bite pan (with 24 bites)- arrange almonds in a single layer. Set aside. In a heavy pan, combine butter, margarine, sugar, salt, and vanilla extract. Cook over medium-high heat with a wooden spoon until butter melts, stirring constantly. (REALLY STIRRING CONSTANTLY)! Bring mixture to a rolling boil. Continue boiling (AND STIRRING) an additional 5-7 minutes until candy turns the color of almonds (about 300 degrees). Pour over almonds. If using the brownie bite pan, I use a small metal scoop to get toffee into each bite, working quickly! When candy is cooled and set (about 2 hours), spread chocolate over top of toffee. Sprinkle generously with ground walnuts. If doing both sides, use only half of the chocolate and walnuts. Allow top to set before flipping over and doing bottom. When set, pop out of silicone pan and store in a airtight containers. OR cut into pieces. ENJOY! Tip- when I say stirring, I'm talking taking that wooding spoon and whipping it! haha!! I have an electric stovetop and turn my heat on 7...and it remains on 7 through the entire boiling process. If you choose to scoop into brownie bite pan vs.pouring into a baking pan, your butter might separate a little bit by the time you get to the 20th scoop! Don't worry about it. I use my scooper to slightly stir as I take a scoop of toffee. Many will ask WHY DOES MY BUTTER SEPARATE? This can be from using cheaper, thinner lined saucepans. It could be from heating the butter and margarine too quickly. You may say, "CAN I USE ALL BUTTER?" The answer is yes. However, I find I get reliable results, with no separation of butter and sugar, when I use half margarine. The flavor is still amazing! I HOPE this helps!! ENJOY! Looks delicious! Just pinned it for later! YUM! I LOVE toffee! Your pictures are beautiful as usual! Thanks for sharing this recipe! I have the perfect new addition to my Christmas plates this year! Awww thanks Nikki, that means a lot coming from you 🙂 ENJOY the recipe! Your daughters are gorgeous, Aimee! And they look just like you 🙂 this toffee looks incredible! So buttery and smooth, and I love the almond accent on top. Definitely a must-make for xmas gift-giving! Hi Aimee, I found you via Kayle of The Cooking Actress. She commented above. 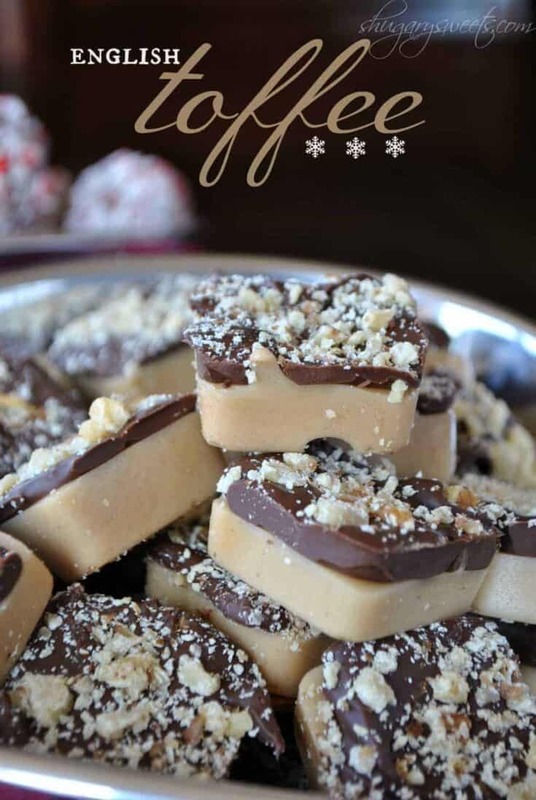 I have my own toffee recipe, but this looks good! Thank you! So glad you found me! So many delicious goodies! If I may, I’d like to invite you to submit your photos to the new YumGoggle, a photo sharing site with the philosophy that if you worked hard to cook it and photograph it, we should show it off! Hope to see you there soon! If using the brownie bite pan (24 servings), does this recipe make just one pan? yes!! Sorry, I need to fix that. One pan! You’re the truffle and toffee queen! I can’t even keep up with them all – one looks better than the next, Aimee! I’m so glad you enjoyed this recipe! I love feedback, thank you for the sweet comment. Enjoy the toffee! Everything looks wonderful!!!! 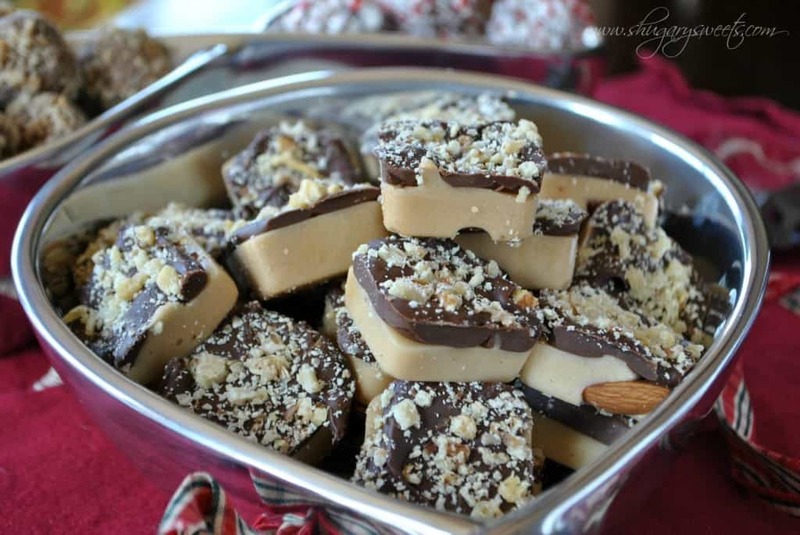 I love toffee, and these look easy and delicious! It’s beautiful Aimee! I love the silicone pan idea. Perfect! Thanks Dorothy. The silicone pan just works so perfectly. You just pop them out when they are set! This toffee is amazing!!! I want a belly full of it!! What a great tip to use the brownie bite pan! I have one of those and some other shaped silicone pans. You are a genius! And this Toffee sounds fantastic. These toffee bites look Amazing! I love toffee. That’s it. I need these in my life! That thick layer of toffee – I’m in total love! Those look fantastic. I cannot wait to try this recipe. Great idea using the brownie pan. I seriously can’t stop staring at that top picture. I want to bite into the corner of that toffee piece SO badly. Hahah, that’s how I feel about a bowl of toffee too…it’s just begging to be eaten! Can you make these without the almonds? My children have nut allergies. They look delicious! Sure thing! I make a batch or two every year with no nuts! Still delicious! Thank you for posting this recipe. Toffee is my husband’s favorite and I cannot wait to surprise him with this! Have a question. We’re talking some boiling hot candy here.. how do you pour the candy out without making a huge mess? I’ve made something similar (not this exact recipe) and you just dump it on the pan (or crushed walnuts/chocolate). I love the way those pretty things look from the silicon, just wondering how to do that without wasting a bunch of mix or whatever. These look fantastic! I really cant wait to try them! I bet they would make fantastic christmas gifts! Oh no Mary! Did you stir constantly? Not sure how that happened. Was it before/after the boiling process? I wish I was in your kitchen to see what happened! I know how frustrating it can be when something doesn’t work properly! Did you use a wooden spoon? Just checking some of the little things. Sorry. In the recipe above I stated cook to about 300 degrees. And yes, stir constantly while boiling. Hope this helps! If you melt the butter to fast it causes it to separate like that. Just melt butter over a lower temp next time and it should turn out just fine. I love the idea of the small bites and not having to cut them. Also, a HUGE thanks for the room temp tip for the chocolate to not separate! I feel as though I am a novice with the silicone, though. do you have to spray it or coat it with anything for the toffee to pop out? Nope, don’t spray the silicone! Once it has hardened and set up, the toffee will pop right out! How do you cut the treats into perfect little squares without the toffee breaking or crumbling? If you use the silicone brownie bite pan you don’t have to worry about cutting it and it comes out in those cute squares! Otherwise, if you pour it into an 11×7 you will get some breaking and crumbing…just comes with the territory! It’s a crunchy candy. Hard like a piece of toffee!! No nuts works just fine too! I use a small metal cookie scoop to get the toffee into each bite! ENJOY. Oops I forgot to ask how many pieces does this recipe make with the brownie bite silicone pans? Thanks!! One pan has 24 bites…it should fill up the pan! ENJOY! 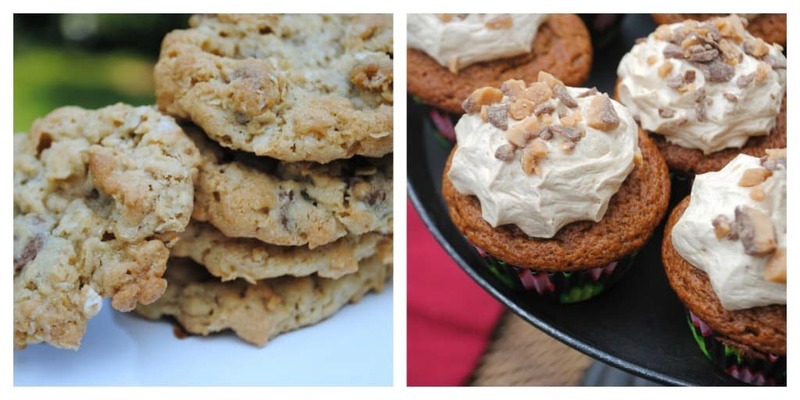 i tried making these today…but my butter mixture didn’t harden. and when i tried it…hours later after refrigerating the bottom mixture tasted like the sugar didn’t melt…i’m not sure what i did wrong! and it didn’t get hard/crunchy like toffee. it’s really soft. You should get a kick back from Wilton! Because I went right out and bought A) The stuff to make these yummy things and B) Two brownie bite pans! You rock! Thanks so much. Haha. If only!! ENjoy the toffee!!! I love your idea of using the silicone mold. I love to make toffee but hate having to cut it up. Thanks for sharing! Congratulations for getting featured at I heart nap time. So was I so I stopped over to say hi and Merry Christmas. Merry Christmas to you too Wanda Ann!!! I’ve never made toffee so I’m unsure how much of a mess I have the potential to make here, lol! Will this work if I make this in a nonstick mini muffin pan? Or will it stick and not come out? I looked for silicone pans and they only had quite large gingerbread man molds :-/ I want them to be pretty when they’re finished. I wouldn’t put them in anything other than silicon or a foil-lined baking pan. Did you check out Michaels? That’s where I bought my silicone brownie bite pan (I know you can also buy it online)! Good luck! @ Mary — i had the same problem just now. the batch i made last week were great then this morning i had the butter floating on top so i tried again and it happened again. i tried both room temp and cold butter. i wonder if it cooked too long? At what point did the butter separate? While stirring, you really need to be stirring quickly with a wooden spoon, if it starts to separate in the beginning before boiling, that’s okay. KEEP stirring. If it separates after it has boiled, and the color changed, you went too long. I hope this helps. I think I need to do a video on this one!!! Thanks Eden! I did add that the temperature should reach 300 degrees, I know some stovetops heat faster! I’m glad it worked out well for you! So delicious. And, I agree, it doesn’t make nearly enough! My husband and I usually make at least a dozen batches (sometimes more) over the course of the holidays to give to friends and family! Looks delicious! I’ve pinned it for later – and plan to make it! I saved your recipe this looks delicious! I am on the hunt for some new holiday treats. Now to find a recipe for a non nut fan! Off to look around some more. You could totally leave the nuts out of this recipe. I do that for my hubs every year! No almond, no walnut…still delicious! I have tried this 2 times and have had no luck. The first time my thermometer read 300 and it turned almond color but the butter separated and I really was whipping it. I poured it anyways in to the brownie bite pan, let it sit. There was butter on top and when I popped them out there was like grease on the bottom. It did not get hard like toffee. I tried again this morning and didn’t cook it as long (297) I poured it out again and now it tastes like a cube of sugar. It is not hard at all, but I had no separation in the pan with the butter. Can’t figure this out. Is it suppose to be like peanut brittle? Any suggestions would be great. I was wondering what unblanched almonds are. Are they raw? Im looking forward to make your recipe they look delicious. Thank you. I asked my husband, who is more knowledgeable than I am, and he said that blanched almonds are almonds that have been boiled. I noticed that all of the almonds that were in the nut section of my baking aisle were blanched. I went to the snack section and found a bag of whole, raw almonds – which didn’t say “unblanched” but, hubby said that since they were whole, and the skin was still on them, they *should* be unblanched. 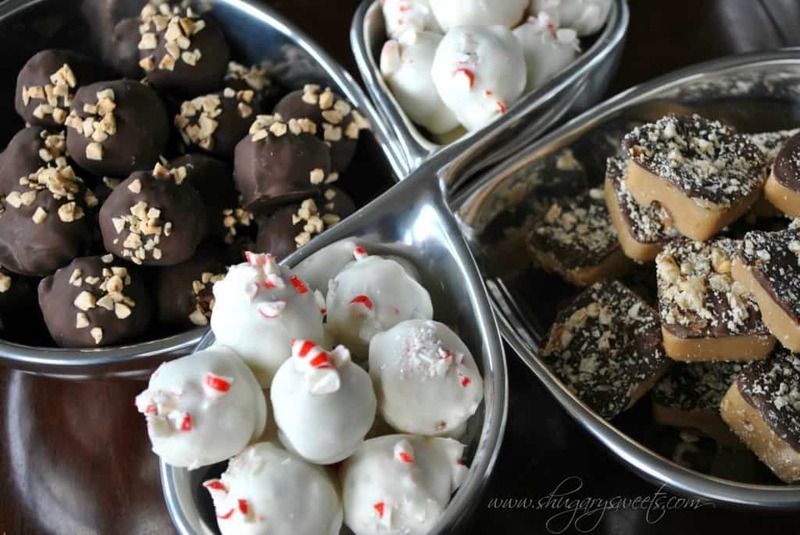 What are the white chocolate peppermint balls? Can you provide the recipe for them, also? They look delicious! At 250º the whole thing broke and I had butter and weird sugar separated. Total loss. I stirred constantly with a wooden spoon in a heavy bottom pan. Very sad. This is one of my favourites to eat. Not sure why it separated. My husband and I are planning on making some more on Sunday, I told him we need to video tape the process and post it on here! Hopefully by mid next week I can have that done! Sorry it didn’t work out, I wish I knew why! I know the recipe called for a wooden spoon but I recall an episode of Good Eats where Alton Brown says silicone is the best option for candy as being non-reactive. In my own experience, this sort of toffee never worked for me until I switched. Just my two cents though, since I do know dozens who have no issues with their wooden spoons. I’ve only ever used a wooden spoon, but I imagine silicone would work! It’s perfect for high heat! And I LOVE Alton Brown! This is my new addiction! Thank you for the recipe! I’ve already made three batches, and I’m getting ready to make a triple batch tonight. I, too, have experienced the butter separation. Mine separates the second it starts to change colors (I’ve been watching closely, thinking I somehow missed a step). After this happens, I’ve been pulling mine off of the heat, draining off most of the excess butter, and then whipping again to mix back in any remaining butter as it cools slightly. This has been working for me. I don’t know how it compares to yours, but it still tastes fantastic! Can you tell me what unblanched almonds are? Are they raw almonds?? Thanks. Yes, they are raw!! ENJOY! I’ve just found your site and I’m in heaven. I, too, love to bake, so I’m basically a kid in a candy store here. English toffee is a big favorite of mine, and I’m sure to make this at some point soon! Can you tell me what kind of chocolate to buy? Can’t wait to make these!! Saw it. Made it. At midnight. Sooooooo good. Best easiest toffee I’ve ever made. Thank you! When I make this recipe, I add the almonds to the toffe while cooking. I use a half cup of chocolate chips and spread them on top of the toffee after spreading it in the pan, while it is still hot. That melts the chocolate. No problem with separation while cutting! great tips Robin, thank you!! That’s the best English toffee that I’ve ever seen. It looks delicious! I made these today and turn out ok but my toffee splited when I was pouring it in the silicone pan…I guess it took too long even thou I was trying to be as fast as I could. You mentioned that you avoid this by stiring with your metal scoop but that didn’t work for me. I put it back in the heat and kept stiring but no luck…I had to pour out all the butter and with the rest I did some more toffee. I still have to try if they turned out ok. With the brown butter I poured out I made chocolate chip cookies!! so nothing wasted there!! Oh my goodness! This recipe was delicious! I made it just as you suggested “whipping” the ingredients together constantly. It turned out perfectly on my first try. My husband is not crazy about chocolate, so I left that part out. He loved the toffee so much that they were all gone in 2 days! Thank you so much for the recipe. I’ll certainly make it again, and again! I’m so glad you enjoyed the toffee. Thank you so much for coming back and leaving feedback!! ENJOY! These look so good! I really want to make them but would like to avoid the cutting. I have a regular mini muffin tin, would that work? I made two batches of these; one with regular chocolate and one with white chocolate. They turned out great! Thank you for the recipe. The silicone brownie bite pan is a great idea. I followed your instructions and proportions and they were spot on. I used a thick silicone spatula for stirring (whipping!) the toffee and a plastic 1 Tbsp measuring spoon for scooping the toffee into the molds in lieu of a metal scoop to avoid scratching my non-stick pan. If you’re using the brownie bite pan, do you fill them all the way up with the toffee or leave room for the chocolate? Leave room for chocolate! Not much though! I read a comment above where the baker left out the almonds and the walnuts, and they turned out great! Good luck! I’ve never used kosher salt before. What is it, exactly, and where do I get it. Can I substitute regular table salt for the kosher salt? These look heavenly! you can get kosher salt at the grocery store (right next to the table salt). It’s coarser and I love using it. This might sound silly nutty if the toffee is completely cooled, how does the chocolate layer melt? 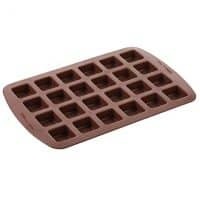 you melt the chocolate first before spreading it on. I asked this question on her Facebook post, this was her reply: Shugary Sweets kosher salt is not as fine as regular salt, so I would use about half the amount listed in the recipe. Do you think I can use margarine instead of butter? 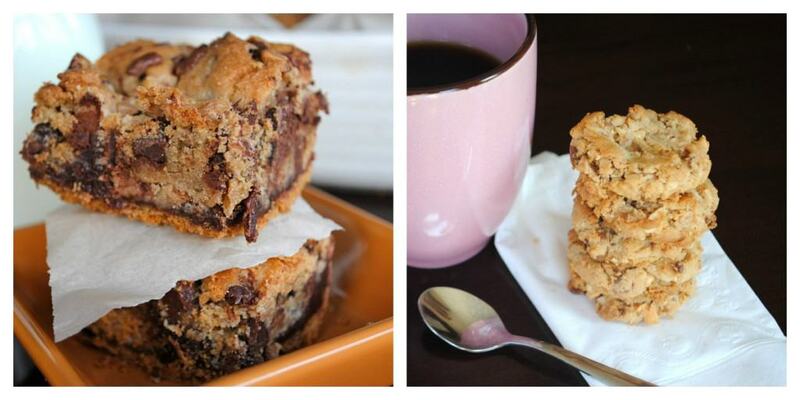 What an awesome idea to use your brownie bite pan! These look fantastic!!! So, when you say cool completely, do you mean in the fridge or room temperature? Oh man! This sounds easy and fun! I need to find some of these brownie trays you speak of..
Do you mean the butter separated a little bit? Mine did too. Just give it a good stir and pour the mixture into a pan and the butter goes back into the rest of the mixture. I made this today and loved it! It tastes so good and was really easy. I gave some of my batch to my friend who has been having a bad week and she absolutely loved it too. Thank you for sharing this recipe! I am so excited to try these! I even went and bought the pan from Michaels. I am so OCD when it comes to making my candy for the holidays!! Why did I never think to use that adorable pan??? Just made this toffee for the first time and it turned out wonderfully. I would only change one thing instead of whole almonds I would use chopped coarsely. I’ve made 4 batches and not one came out right. I don’t know what I’m doing wrong? The toffee will not harden at all. So I started over and cooked it longer and it just turned into a foam mixture any tips? If the toffee is not hardening, it’s not cooking long enough. It literally will go from light butter colored to light brown (almond colored) in seconds. Once it turns, you need to remove from heat. While it’s cooking and getting to the right temperature, it will be foaming. Marissa, when I made mine it started to turn foamy as well but I kept stirring because my candy thermometer said it was not at 300 yet, it will kind of thicken and foam then change color before it is completely done. Question, can I just use a dark costing mini muffin tin? Or what about using the little liners? Looking forward to making this. Hi Amy-I have to tell you after reading some of the comments on these, I was a little hesitant to try them, but I forged ahead. I ordered 2 of the silicone pans on Amazon last night, but could not wait to get them to try these. I had a set of 12 standard silicone muffin liners, and thought I would try the recipe with these. It was SO easy and everything came out beautifully. I just put about 1/4 inch of mixture in each liner. After cooling, they just popped out. I had a little mixture left over, so just put it on to a silicone pan. They are SCRUMPTIOUS!! I followed the recipe exactly, using a candy thermometer to 300 degrees and used a silicone spatula to constantly mix it. I will have to try this on my old high school friends, because a few years ago I had some toffee at a get-together for them. I did not want to serve it because I had done something wrong and it was too chewy and stuck to your teeth. The girls said to serve it anyway, and all of a sudden one girl came up to me and said she was going to have to leave because one of her false front teeth had come out while she was eating it. I was trying to act concerned, but hon estly I was dying laughing on the inside. Well, thanks to your recipe, this won’t ever happen again. Yours was the same consistency as some I used to buy in a fine candy shop. Thanks for the recipe, and have yourself “A Merry Little Christmas”! I cannot find a brownie bite pan up here in Canada, wondering if it would work to use a mini muffin pan lined with small baking cups?? Thanks!!! Oooo another awesome looking recipe with from scratch ingredients. Love This Recipe!!! I made these last year they were awesome. my only question is can you refrigerate days or does it change the consistency of them? same question for the freezer, can you freeze them? I would like to make them about 10 days before giving them away as gifts but I’m sure if they will become rancid. thank you for your help. I like to keep them at room temperature or in the refrigerator. I don’t think I would freeze them. 10 days would be totally fine! Just make sure to keep them in an airtight container! What are the white truffle type cookies in the bottom picture? If you do use a silicone brownie pan, how many pans does this one batch need? It seems much tidier. One batch will fill one silicone brownie pan (the kind that has 24 individual bites). this sounds amazing i can’t wait to make it. just wondering, when we cool it should we refrigerate it or just allow it to sit at room temperature? Just made these as homemade Christmas gifts. Thanks to your great directions, they turned out perfect and will be such a treat to give. Thanks a million! So glad to hear it Ashleigh!! Thanks for stopping back over! Can I substitute the margarin for all butter? I’m wondering the same thing. We do not use margarine. I’m thinking of maybe trying coconut oil and butter. Using a combination of margarine and butter helps keep the butter from separating! I haven’t used coconut oil, let me know if it works. I did two batches with all butter and it burned each time, by the time the sugar was melted. Once I get more butter, I’ll try again, but… yeah. 1 C butter and 1 C sugar does NOT work. Does this recipe work if you use all butter and no margarine? I really dislike margarine cuz it’s fake. Id rather use the real stuff. Thanks! This looks so yummy! I have a question though, can all butter be used instead of butter and margarine? You can. But it can separate, whereas using half margarine keeps it combined better. I’m wondering the reason you use butter and margarine. Can’t you just use all butter? Sorry, didn’t read the prior answers. I would risk it myself, as margarine is so very bad for you. I want to try this also sugar free, using xylitol. So, this really doesn’t take brown sugar? I followed the instructions perfectly, but the mixture never turned to the color of almonds. Still pretty yellow-ish. It is setting up now. Hoping it turns out well. Hi Michelle, if its still yellow then it didnt cook long enough. Once it begins to change colors, it happens fast! I am making these now for a party and am really excited about them! You mentioned in response on earlier posts that the Margarine helps keep the butter from separating. Is the separation a problem when pouring into a large pan (vs scooping into the brownie bites pan)? Also, do you grease the foiled lined pan at all? Thanks so much for the great recipe! Tried the toffee — doubled the batch and used tempered white chocolate on top (as a gift for a non-chocolate lover) — truly amazing! I have to say this is the best recipe I’ve tried for toffee, but I will say I used a 8×8 pan foiled line pan and it came out thin, so next time I make it I will double if not triple the recipe . I just finished making them today , I really stired it and even whipped it and they came out great. Any body new trying this stir it the whole time so you won’t have a problem with it ( I didn’t thank God ) I do recommend as soon as you pour it in the pan soak that pan in really hot water and and spoons you used the candy hardens fast and if you don’t soak it immediately its hard to clean . Enjoy I know I did. Made these over the holidays and everyone loved them. Silicone was a great idea. They popped out so easy! English Toffee is, hands down, my favorite dessert. And I need it portion controlled (and adorable!) like this! I have yet to get that video made, ugh, thanks for the reminder!! And yes, thats the mold I am referring too! Good luck and enjoy! I was wondering if I can substitute the margarine for butter? Looks delicious. Was wondering if I can use straight butter instead of butter/margarine combo? You mention pouring the chocolate over the hardened toffee, do you melt the chocolate with anything to keep it smooth. On a double boiler or in the micro? Would love to try this for a candy platter for sharing at work. Looks delicious, can’t wait to try it. Sorry if someone has already asked this, but can this be made with all butter instead of half butter, half margarine? Looks delicious! Thanks!! Do we have to put the almonds on the bottom? Not a fan. Will it ruin the integrity of the toffee? Nope you can leave them out and it will still taste wonderful! Just made this toffee and it was so easy and is so good!! I did tweak the recipe just a bit, I put chocolate chips on the top of the toffee after placing the it in the pan and let them melt with the heat from the toffee. After they were soft, I spread them into a thin layer of and added the ground nuts. YUM-O!! I just found this recipe through Pinterest and I’m shocked that anyone is still using margarine. Margarine and other vegetable oils like soybean, canola, etc., are industrialized fake “foods” and are *terrible* for your health. Switch to butter and see how much better you feel, how much energy you have, and how improved your digestion (and your fertility!) will be!! I make mine with butter and corn syrup. My co-workers go crazy over this stuff! Like the idea with the sea salt. Giving it just a little tang. How about using ice trays in fun shapes? Can you use a metal brownie bite pan? This looks amazing! I just have a problem with an ingredient, the margarine. I was wondering if you had to use margarine? Could I just substitute more butter, or is there a specific reason for the use margarine? How long would this last in an air tight container? Do I leave it on the counter or in the fridge while being stored? I leave it on the counter, and we usually make it the first weekend of December and it lasts all month 🙂 As long as it’s air tight! Has anyone put these in little paper candy cups ( like cupcake wrappers? ) would they totally stick? I’d rather not use margarine if I can help it – do you know if I could sub something like coconut oil instead? You can use all butter. I like the idea of using a bite pan – never saw one before. When I make this, I just use a buttered cookie tray and then break the pieces when they cool. I wonder if bite pans come in silicone? If so, you might be able to pour the candy into the pan quicker and then guide the extra into the pan? Easier than the unforgiving metal? Just came across this while making a links roundup for National English Toffee Day (Jan 8!). 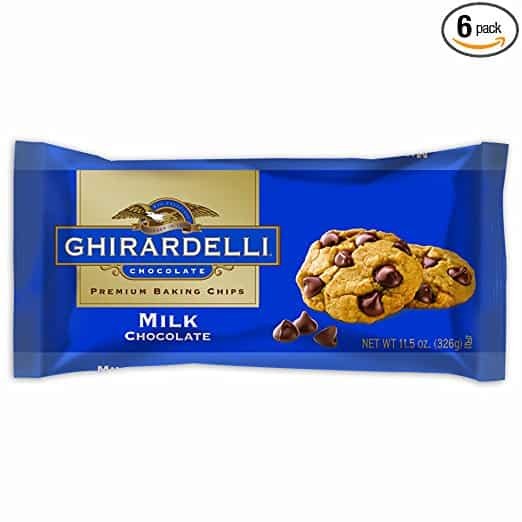 I am going to include a link to these luscious bites – thanks for sharing! I noticed after I commented, that my recipe is twice the size of yours, so If I made it like yours it wouldn’t set up so fast . 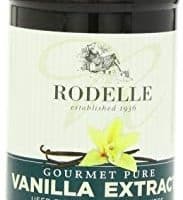 . .
Hello , can I switch the vanilla extract with coffee extract? My husband loves coffee, it would be great to have coffee as sweet treats like this! Sure give it a try, I’ve never used coffee extract! Hi, so the recipe said to let candy sit for 2 hours before adding chocolate but the video said only 5 mins. Just wanting to know which timing is better. Thank you! I do the 5 minutes now if using the square silicone dish. If making a pan (11×7) I find waiting to add the chocolate is better, as it doesn’t fall off when you break it into pieces. Since the silicone dish you don’t have to cut pieces, you don’t have to worry about waiting. Hope that helps 🙂 Great question! My butter separated on the first attempt, I set my mistake aside and tried again, cooked the second batch for less time and same results (but I didn’t reach the almond color). I returned both attempts to a larger pan and re-cooked it longer, probably 10 minutes longer, stirring it constantly and vigorously. The butter still separated but at least I didn’t have to throw it all in the trash and I did end up with a hard toffee that tastes delicious except for the excess butter that I poured off the top and that pooled to the corners of the silicone dish. Are you certain the receipe needs this much butter? 2 sticks=1 cup, maybe you meant 1stick? Maybe it should be 2 cups sugar? I have about a 3/4 excess. I’ve made this recipe multiple times (as in, probably 100 batches over the years). The measurements are definitely correct. Every once in a while (maybe 1 in ever 25 batches) the butter separates and I can’t for the life of me figure out why. The only thing I’ve concluded is you have to vigorously stir it, and it has to reach the almond color in order to achieve the correct texture! Did you see my video? I made these yesterday. The recipe is super easy and they are delicious. The only thing would not do is lauer the bottom with whole almonds. It was much harder to cut and I think contributes to them falling apart somewhat. Maybe Ill try finely crushed next time. I really enjoy your recipes! I have followed your directions to a T…down to the brownie bite silicone trays, wooden spoon etc…I never left the pot, stirred like a crazy woman on speed and still it all separated. I went through the comments to see if others had that problem and alas they have. I saw some posts that said melt butter and sugar on low then turn up the heat…did that, still separated, did your way, heat on 7 for the duration, still separated, tried it again following your directions (maybe I missed something the first time?) still separated. I give up after 3 cups of sugar and 6 sticks of butter…I must not be able to make toffee! Now what to do with all the brownie bite silicone trays I purchased, lol?! I just made these last night using the brownie bits silicone pans, which worked perfectly!! I followed the directions and also had some separation issues, but I just kept stirring even when I poured the toffee into the pans. They set perfectly, though. There was no separation once they set. My husband and I sampled them this morning and they were SO DELICIOUS!!! They brought me back to my childhood when a special candy we liked was Almond Roca! 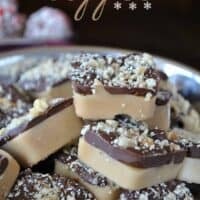 These English toffee candies are easy to make, delicious, and will become part of my annual Christmas treats! Thank you so much for sharing this great recipe with all of us! 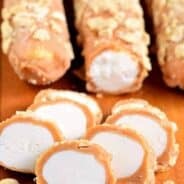 Okay what’s wrong with me I can’t find the recipe for thet toffee bites anywhere! If you’re on a mobile device you need to click the “read more” tab above! wooza, saw it, pinned it, made it, love it. this was soooo easy to make. i heeded your advise and whipped the snickerdoodlez out of the butter sugar mixture. i did chop up the almonds a bit and the chocolate didn’t turn out quite as smooth as i’d hoped. however i love the crunch and flavor and the nuts. this was a success!!! thanks for sharing. oh, and i NEEEED one of them silicone brownie bite pans, cutting up the whole lot was a bit offa mess, as was advertised. I know this is an old post, but have a question for you. How do you keep your toffee soft enough to put all of it in individual squares. It looks beautiful. I do make mine a little different. HA HA HA HA…NICE WORK. How long so these keep? I am assuming you mix the milk with the rest of the ingredients. It was omitted from the recipe. This is a stupid question, but I do have the brownie bites silicon pan – can you pour the mixture over the entire pan and scrape the top rather than dropping them from the cookie scoop or will I still experience butter separation? Hm, I’m not sure, I haven’t ever done that! Hello! So I’ve tried making this batch twice with no success. Both times my butter curdled and there was quite a bit of butter floating around as well. I used a digital candy thermometer and waited till 300 like you suggested. I also stirred like crazy did not stop at all so I’m not sure why it curdled and the butter separated. I tried the first time on medium-high Heat and the second time I lowered it just to medium Heat. Please help me!! I’m confused and would love to make these!! Honestly I’m not sure. There’s a video in the blog post so you can see how I made it and how it looks. Sorry! 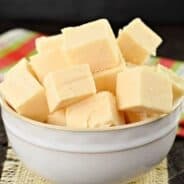 Has anyone tried to adapt butter for vegan? Can you tell me how many brownie bites this will make? How man brownie bite pans would you need to have for one batch? Love this recipe! Making it for gifts this year because everyone I know LOVES toffee! We love toffee! Thanks for a great recipe! One of my all-time favorites, SO good! Came out JUST as expected – DELICIOUS! Such an amazing recipe! Who doesn’t love English Toffee?! Great recipe! I had no idea it was so easy to make! These toffee bites are amazing!!! Love how easy it is to make!!! I have sliced almonds, would they work alright for this recipe or should they be whole? Thank you. I tried another toffee pinterest recipe two weeks ago and it turned out horrible. The butter separated. Now that you have suggested to heat slower, I will give it another go. I was going to move on to another dessert but these look so good! Any suggestions on how the “glue” the chocolate back onto the toffee? I’ve made this is the past but this is the first time I had almost half separate as I popped them out of the silicon bite pan. I have found that if the chocolate falls off, it’s probably due to excess butter on the toffee surface. Before adding your chocolate, wipe the toffee gently with a paper towel, then cover in chocolate. I made these last night. Everything went well until I tried to cook to 300 on the candy thermometer. I thought the color had reached the almond color but tried to get it too 300. They turned out dark and lil a burnt and still delicious. I am making another batch for Christmas. Is it better to cook until it reaches the almond color rather than 300 degrees. I always focus on the color, not the temperature. Yum…this is delicious! My first attempt and I learned a few things. Would definitely use the silicone molds. My toffee just broke into pieces, not too pretty, but no matter it’s that good. Also some of my toffee separated from my chocolate when I cut it, not sure why. And, my toffee cooled and setup in 15 min. , not 2 hrs. so felt rushed spreading the chocolate. It wiPennyll be more presentable next time–it probably won’t be around for Christmas Eve anyway! Thanks so much for sharing!